I stumbled out of bed today, unshaven, in search of noodles. On the way hit the newsstand. Then did a double-take. Doraemon’s in Khmer. At 25 cents a pop. (1000 riel). 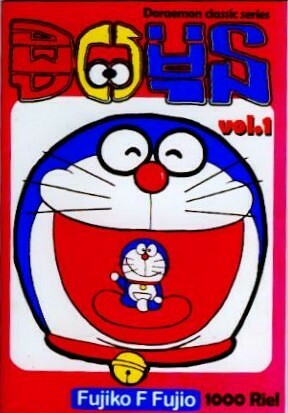 For those unfamilar with the character, Doraemon is the embodiment of fun and adventure, star of manga and anime alike. With a 4th-dimensional wormhole pocket, he has no end of resources for his schoolboy pal Nobita. Kind of a neutered Hanuman, if you will. I bought four copies. One to read, one to give to Khmer friends to check the nuances, one for the archives, one for the Japanese Embassy. Because it didn’t have a copyright. 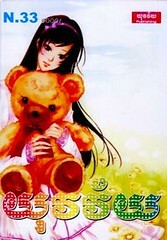 I also bought a few of the 1000 riel books that have a distinctly shojo look to them. It’s definitely time to wake up and smell the cat food. Dropping chili paste and lime into my noodles, watching the ice sublimate off my coffee, I can see that the cheap joke books have slowly created a new market for cheap comics. Modern, well designed comics, not the 500 riel comics that are reprinted from 20 years ago. 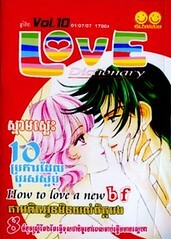 Unfortunately, if Cambodia goes the same route as Thailand, Malaysia, Indonesia, it will be flooded with manga. Because it’s much cheaper to translate than to create original material. And there’s a field tested, proven back-catalogue. All ready for bootlegging. I have great affection for manga and great distaste for intellectual property theft. Not only are the Doraemon bootleggers stealing from Shogakukan and mangaka, they’re taking potential shelf space from local creators. Cambodia’s comics scene began in the 1960s with a largely French influence. I feel a little weird, as if the tectonic plates have shifted just a little bit to the East, and I’m the only witness. A tiny event, but with tremendous repercussions for local art and literacy.